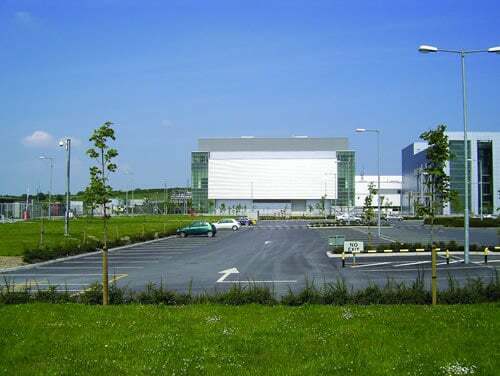 Genzyme Ireland – Duggan Brothers Ltd.
A new Class 100 cleanroom pharmaceutical manufacturing facility situated on the old Kilmeaden Road, Waterford. An existing industrial facility was converted to Pharmaceutical and a new Warehouse, a new Central Utility Building and a new Fill Finish Building were constructed. The work involved was divided into two packages, namely civils with reinforced concrete and the general internal finishes. The civils work included slabs on grade as well as suspended slabs, with stairs and plinths. Site services included watermains, earthing, power distribution. A Tank and Generator farm with associated bunds etc was constructed. The site roads, landscaping and fencing along with the formation of car parking and new entrances were also carried out. Main internal finishes work elements included trowel on epoxy flooring, epoxy floor paint, partitions & ceilings, decoration, steel doorsets, ceramic tiling and sanitary ware.